I am interested in sarees; from their weave, their origins, their cultural stories to their vast range and utter beauty. Am writing a series of articles on different kinds of sarees. Here’s one of them. A saree has never heard of size zero. Actually, a saree doesn’t care too much about size at all. Short, tall, thin, small, fat, squat, what, not… a saree is happy to drape you; no discrimination, no snigger at the inches, no unseemly joy at chancing upon a slim waist. Before the saree, all are equal. My boss once told me, he is Singaporean Chinese, that he thought the saree was the most creative “dress” ever. Just a length of fabric, not a single cut or stitch, inviting you to do what you liked with it, wear it any way you want. He was right, I had never thought of this, of course. Read somewhere there are 107 ways of draping these six yards (there’s of course the nine yard one which I have never worn nor owned). 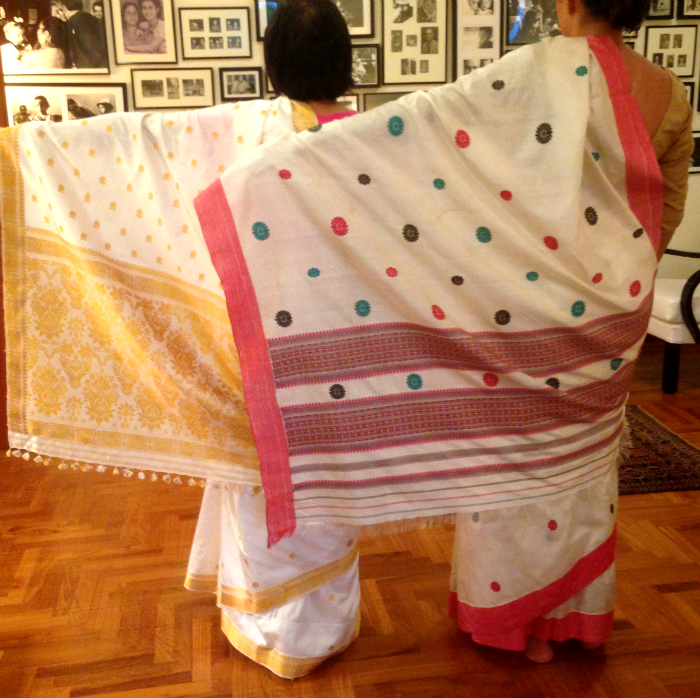 Both my grandmothers wore it the “Bengali” way at home. It was fun to watch them tuck the border at the waist deftly, on the right, the left, then right again, without bothering with the usual pleats in front. And yes, they did tie their bunch of keys to the corner of the pallu and throw it over the shoulder, just like they show in the movies and awful television serials. The two sarees here are both Assam silks. 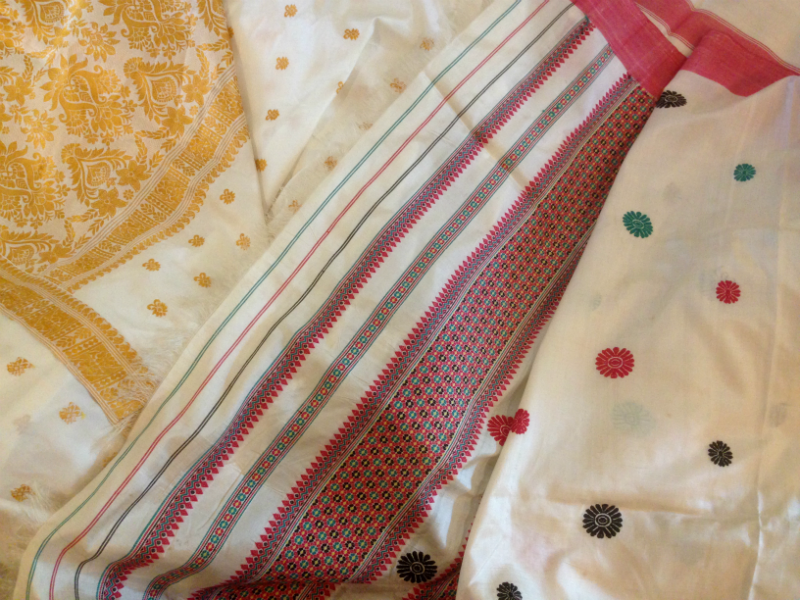 You don’t hear much about these, but Assam makes some really great silk. There’s the rare and gorgeous golden Mooga, there’s Eri and then there’s this white mulberry silk called Pat. The pureness and sheen of the white and the creaminess of the t exture are delightful. The fall is dreamy. Bought the one with red, green and black motifs almost thirty years ago, from Assam Bhavan on Russel Street in Calcutta. 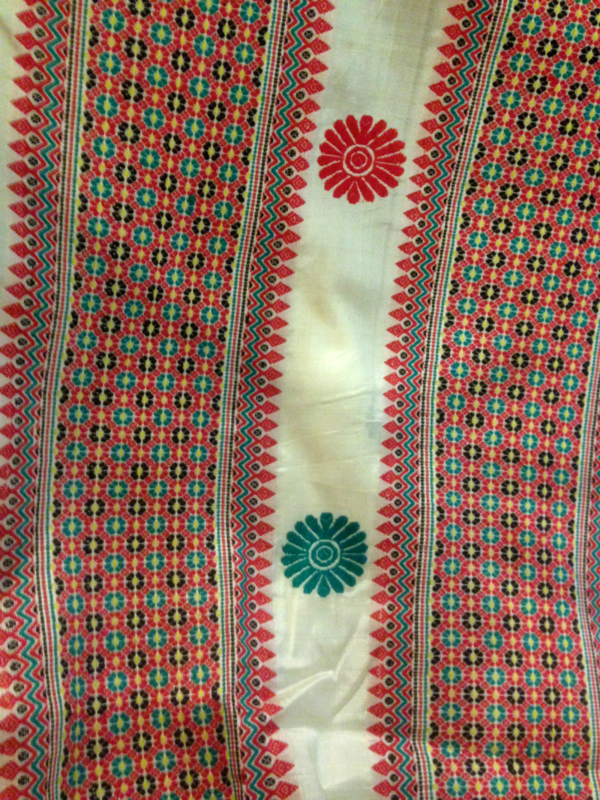 My first Assam silk, part of my wedding trousseau. The silk is smooth and fine, the design has a tribal feel; there are several tribes in Assam with their own range of wonderful motifs and colours and weaves. This craft is dear to the Assamese people and traditionally all girls learned to weave, one of those accomplishments that a ma in law looked for in a good daughter in law. I remember seeing looms at the homes of at least three families in Duliajan, where I grew up. The other one with the golden butis was chosen recently by a dear friend of mine who moved to Guwahati. It’s really pretty and elegant. Between the two, a span of almost 28 years. A lot has changed in that time, and yet like the whiteness of the silk that is almost unchanged are some things in life too I guess. 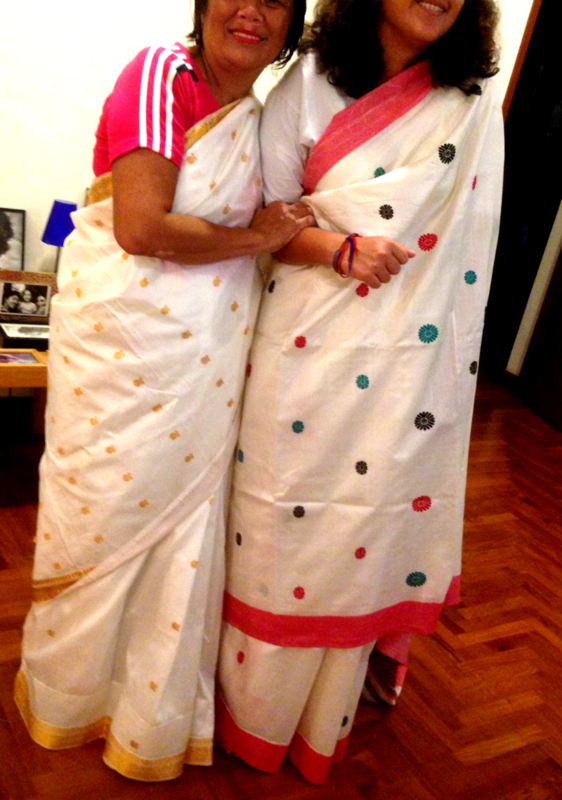 Most importantly, the saree that used to fit me when I got married fits me even now. I’d like to thank my two models for suffering my lunacy without too much protest. I thought they both looked rather pretty. Nothing is quite as precious as trust.